We truly live at a momentous time. Play your cards right (whatever those cards may be) and you'll provide for your foreseeable generations to come. 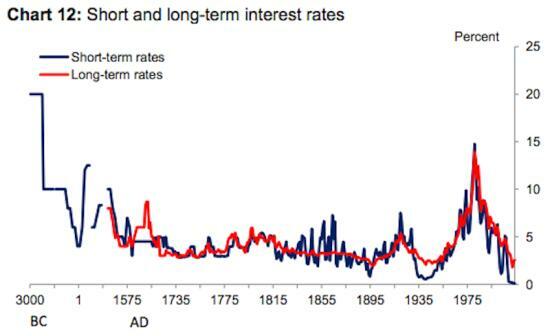 Business Insider’s Myles Udland just posted a chart, drawn from research by the Bank of England, showing interest rates for the past 3,000 years. And for all those who’ve been feeling like today’s “new normal” is actually profoundly abnormal, here’s your proof. It turns out that interest rates, both long and short-term, are lower than they’ve ever been. Not lower than in this cycle, or post-war or in the past century, but ever, going back to the earliest days of markets. And they’re still falling in most of the world. Central banks are cutting rates on a daily basis (Turkey was today’s announcement), in some cases to less than zero. Something like $2 trillion of sovereign and corporate debt now trades with negative yields. Virtually the only major entity considering raising rates is the US, and the incongruity of this threat has traders balking. See Bloomberg’s Traders still don’t believe the Fed is ready to raise rates . The insurance industry, pension funds and money market funds all depend on positive yields to operate. A life insurance company, for instance, can keep premiums low because it can invest that cash for years before having to pay out on the policy. What happens if the bonds it buys start yielding nothing (or less than nothing)? What about a money market fund that can no longer find investment grade corporate paper yielding much more than zero? Pension funds, meanwhile, have generally promised 7%-8% returns to their members, but now have to get all of those profits from the equity and real estate sides of their portfolios. For any of these entities to stay in business they now have to act like hedge funds, taking on extra risk, rolling the dice and hoping that the good years outweigh the bad ones. In other words, these formerly safest-of-the-safe investment vehicles become just as risky as the typical eTrade account. But zero or negative rates? Are they just an extreme version of low rates or is there a qualitative difference? Everyone has a theory about this but in the absence of historical precedent, we’ll have to wait and see. Anyhow, the coming negative interest rate world will provide plenty of thrills, chills and blog post material. For now it’s enough to note that we’ve never, through depressions, world wars, bubbles and famines, seen anything like today’s economy.